Is it really possible to FALL IN LOVE with your rv insurance company? Is it really possible to fall in love with your rv insurance company?! Well, at least I have developed a healthy respect for them! Allow me to introduce myself, my name is Alan Sills, I am a full time RV’er and have been since December 2011. At the age of 53, I was a bit young to “hit the road” full time, but I run my business largely from the keyboard of my laptop, so, thanks to the Internet and wifi, I am able to support my traveling lifestyle from anywhere! 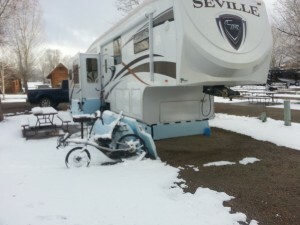 I have had my rv insurance with ExplorerRV since nearly the beginning. It was more than that though – from the get-go, they demonstrated that they clearly knew their business. They were licensed in the state in which I was establishing a residence (South Dakota) and they recommended the right options for both my new truck (a 2011 Ford F-250) and my “5er” (a 2011 Crossroads Seville). Knowing I was going to travel full-time, it was important to me to have enough coverage, and as my first year on the road has demonstrated, those choices early on were very important when “incidents” occurred during the course of my travels. 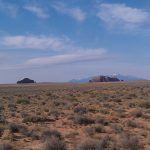 It was one beautiful morning near Moab, Utah where I let my guard down – just a little, and it cost me. Just outside of town, I entered a “BLM” (Bureau of Land Management) Campground. 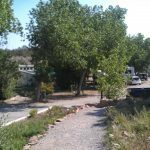 The campground, and access road were clearly not designed for a rig my size, and in trying to navigate through, I ran over some large rocks – large enough to cutup the underside of my trailer. When I got back to Moab, I realized I had done some damage, but I still had no idea the extent. I stopped in a small town about 60 miles South of Moab, spoke to a mechanic who looked and saw one of the tanks was damaged, but again, he (and I) had no idea of what I had really done. My first call was to ExplorerRV claims, and this is when my choice to use ExplorerRV really began to pay off. My claims agent explained that it was MY choice as to where to bring the RV for repairs, AND that if a hotel stay was needed, I was COVERED for up to a dollar figure that would (if necessary) allow me to spend the better part of a month in a hotel while my RV was being repaired. My next call was to the manufacturer of the RV. After sharing where I was (just a bit south of the middle of nowhere! ), they recommended a repair center in Albuquerque, NM. Just a “short” 350 mile drive from where I was! Since my RV was drive-able, I decided to make the trip to Albuquerque – and I found myself hoping I would not end up saying “gee, I shoulda made that left turn (in Albuquerque)” – sorry, I had to. Rocky Mountain RV was to be my repair center and ExplorerRV arranged for an adjuster to see my rig, I then awaited the news – over $15,000. In damages and an estimated week in a hotel once parts arrived. 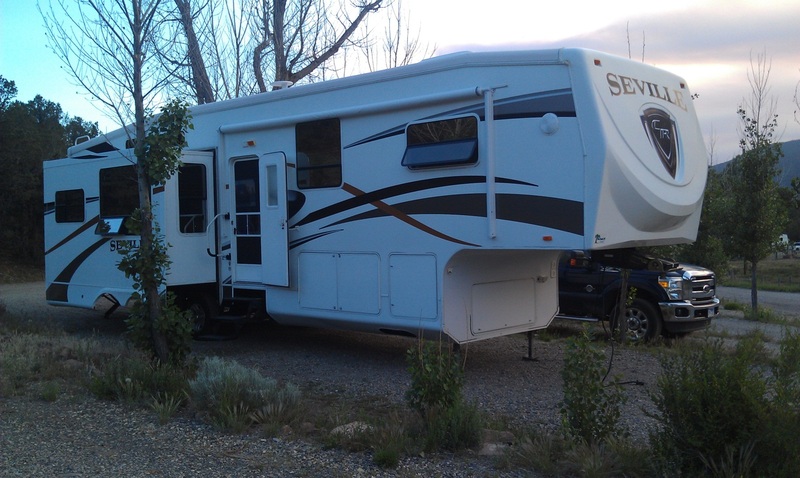 In the interim, the repair center recommended a local RV park to stay at. My claims agent then worked with the service center to arrive at an agreed upon figure and then mailed me the check that I would later present to Rocky Mountain RV upon completion. 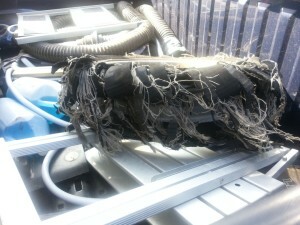 As I’m sure is often the case, repairs took longer than expected, and the service manager had no issues clearing it with ExplorerRV that I could extend my stay at the Best Western in Old Town where I chose to locate for the days I would be “on vacation”. All that occurred in May and early June, only a few weeks later, in mid-July, I had a blowout underneath one of my slideouts on the 5er. By now, I was on a first name basis with my rv insurance claims agent! This repair was handled just as smoothly as the first. 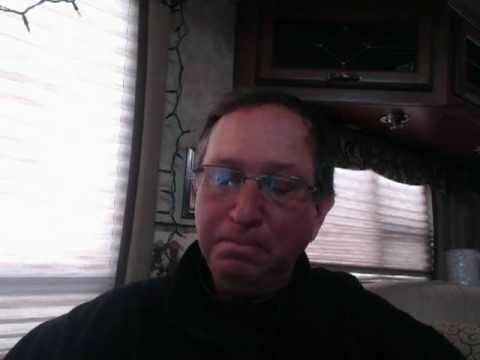 I chose the repair center, McClains RV in Denton, Tx. – another honest and superior and highly recommended RV repair center, ExplorerRV handled negotiations with their service writer, arrived at a figure, and the process towards completing repairs was begun (again). 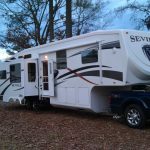 Are you an “RV’er”…thinking of getting an RV? Have you joined RV Across America (on google+)? Click HERE to join now (free). Since then, things have quieted down a bit! No claims in the past few months. 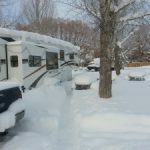 I’m set for the winter in Steamboat Springs, Colorado (hey, I’m a skier!) And…I can report this – I received an offer of renewal for another year, and despite two claims totaling nearly $19,000., my total insurance (for the two vehicles) went up only $150. Now do you see why I titled this article as I did? THANK YOU Alan Sills for directing me toward Explorer RV Insurance Agency ! I finally bought my first RV – 2007 Pleasure Way Lexor TS. Before the dealer would release the vehicle – I financed it -I had to get it insured. I called Allstate which I currently have my SUV insured with . They were quick to add the vehicle to my existing policy and sent through whats called a binder to the dealer whom then released the vehicle. On my way back home to Florida – I collected it up in Philadelphia – I saw Twin Peaks RV insurance advertised on the side of another vehicle. This triggered me to start thinking if I had the right insurance and also reminded me that you had posted VALUABLE information in this regard. When I got back home I called Allstate for the finer details of my policy , Twin Peaks and Explorer RV , for quotes. Allstate did NOT have me insured for what I payed for the vehicle!- They do not offer this. Should the vehicle be destroyed an adjuster will look at comparables to see what the vehicle would be worth at the time which mean I could end up owing the Bank thousands of dollars! With all the rest of the offerings …Allstate could give me the same however my policy would be $1600 a year. Twin Peaks came in at $859.02 a year….with NO mention of whats called “Purchase Price Guarantee” . Explore RV came in at $702 a year …under my current Florida zip code. If I register the RV at my second home in Arkansas zip code, they will lower my policy to $479 a year . I have everything covered including $750 should I have to be put up in a hotel or rent a car – I can only get the higher amounts of $1500 or more if I was a full time RV’er which Im not. What a pleasure it was dealing with Laura Mammone at Explorer RV Insurance Agency. She was the one that made me aware of “Purchase Price Guarantee”. I’m sure there are a LOT of RV’ers out there that may have no idea of this very important coverage clause …especially if an RV is financed over 15 years …or any amount of time as a matter of fact! Another plus was I was able to pay them using a credit card with NO extra charges for the fee’s they incur. Allsate charge me 5% more for using a credit card. Once again , Thank you . I’m glad to hear it is all worked out. They are a solid – I found out how solid when I really needed them.